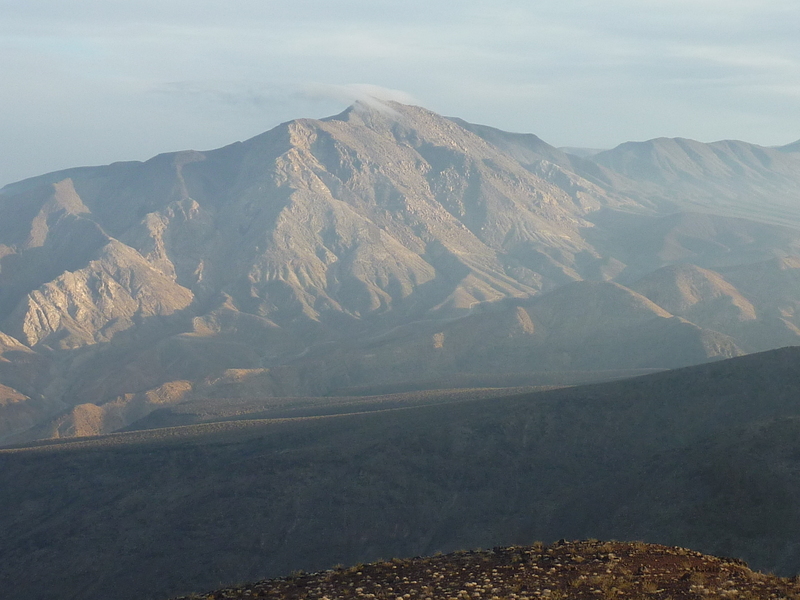 The day had been devoted to a climb of the remote Saline Peak, but we never made it. Knowing the drive to be a long one but thinking the road conditions not too bad, we chose to take Karl's Element rather than Tom's Jeep. The Element did just fine for much of the drive, getting us to Saline Valley Warm Springs around 8:30a. We stopped to check out the eclectic mix of desert, springs, art, and people that have made something of an alternate lifestyle out in the middle of nowhere for decades. We continued further east on the road to the hot springs where a large group of 4x4 enthusiasts had gathered and then went further still. The road deteriorated to the point where we were driving in a rocky wash and wondering if we were going to get ourselves into trouble. Still some seven miles from our destination we decided to cut our losses and return. Possibly the most hours any of us had driven without even setting eyes on our peak. It was noon before we got back to our camping spot near Hunter Mtn, by which time I had hatched an alternate plan to get us at least one peak on the day. Located at the far northern end of the Argus Range, Zinc Hill is really more a mountain than a hill. Prospectors and mine operators have left roads, trails and more than a few mineshafts on the slopes surrounding Zinc Hill. With a regular passenger vehicle one can drive as far as the TH parking for Darwin Falls, but with Tom's jeep we could do much better, reducing a 5-mile hike to something only a third as long. There are a number of options one can utilize for a starting point. Ours was neither the best nor worst available, nor was it the most obvious, but it would work. Tom seemed to be having fun driving the jeep on roads that had both Karl and I nervous. "Oh look - we could park there..." was a common refrain that Tom ignored a few times before finally stopping. The fine weather of the past few days had turned us on as we found ourselves enveloped in clouds. We expected no views today (interestingly, Zdon in his description in Desert Peaks had pretty much the same experience as ourselves with enveloping clouds). There was nothing tricky about the hike, more or less just pick a route going up. We started up the remnants of the road Tom had been driving, continuing up a gully when the road turned sharply to the left (it ends a quarter mile later at a mine site). The gully turned steep as we veered left, scrambling over slopes filled with rock that provided a fun workout. As we climbed higher we found ourselves pushing through the lowest cloud layer and soon had a not-so-shabby view overlooking the landscape. It took about an hour to go just over a mile while climbing some 1,700ft to reach the summit. A large, rough cairn had been erected there. A register placed in 2009 had 9 pages of entries. The summit was between cloud layers giving the place a Pacific Northwest feel with clouds rising from below and creeping over the ridgelines (of course the dense forests and green landscapes were entirely missing). On the return we took a somewhat different route, utilizing a miners' trail that ends at a shallow saddle northeast of the summit. We followed this down for almost half a mile, then diverting right so that we'd get into the proper drainage. It was in this drainage that we found yet another old road higher than the one we'd driven in on. This one looked to be in as good of shape, perhaps better. After following it down some, we had to skirt right once more into the next drainage to be in the correct one. We noted that this was where we'd turned left on the ascent - had we veered the other direction we'd have promptly found the road just above. It made little difference in the end because the route was short and not a difficult one. We were back to the car in just under two hours. Almost immediately Tom realized we had a problem - he'd left the headlights on and the battery was dead. There was no serious alarm raised, panic held at bay since we were lucky to have a standard transmission that could be push-started. It wasn't easy with the three of us pushing the jeep over rough terrain to get enough speed to allow it to start. The first effort, with the transmission in 2nd gear, was a failure. We caught our breath for a second try, this one successful while in 1st gear. We managed to drive all the way back down to where we'd left the other vehicles near the pavement without further mishap. We made sure Tom could stop the engine and start it again before heading in separate directions. Tom needed to get home for work the next day while Karl and I planned another day in the area. In fact we decided we might have a bit of time for one more summit today. This summit of modest prominence (>500ft) is located between SR190 and the town of Darwin. It is the second highest point in the Darwin Hills after Ophir Mtn. I had climbed the latter with Tom a year earlier at the end of a long day. At the time, I tried to get Tom to do Darwin BM as well and we even drove to within half a mile. But it wasn't as close as Tom would have liked and we ended up driving back to camp so Tom could get a warm shower. We were actually an hour later when we got to near the same starting point at 4:30p, but this time my partner was more willing. Surprisingly so, really - Karl was downright enthusiastic. It helped that I mentioned it was also the highpoint of the Darwin Falls Wilderness - for some reason these have become things to collect as well (I've gone out of my way to tag a few of these, I admit). It was only several days later when I got home that I realized the wilderness highpoint was on a small bump 1/3mi further east. Oh well. We had a nice walk at sunset to the highpoint, taking but 30min at a leisurely pace. We stopped often to photograph the landscape as well as the colorful sky we were presented with as the sun was setting. It grew chilly quickly as the sun faded so we donned jacket or fleece depending on what we had in our packs with us. On the return we came across a very deep mineshaft that was only poorly protected. It had a rickety wooden ladder descending into its depths that Karl jokingly suggested I give a try. It looked like a 5.7 ladder, beyond my comfort zone for free-soloing.